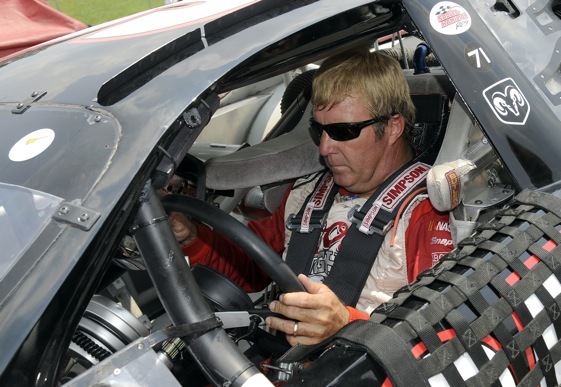 NASHVILLE, Tenn. – Sterling Marlin is leaving Father Time choking in his dust. Sterling turned 60 on June 30, but despite having enough candles on his birthday cake to set off the fire-alarm sprinklers, he continues to race like a teenager late for a date on prom night. Sterling has won two races this season at Fairgrounds Speedway – where it all began over four decades ago – and says there is plenty more gas in the tank. “I feel like I’m still competitive, and I still enjoy racing and working on cars,” says the pride of Spring Hill, arguably the most popular racer ever to crank a wheel at the legendary old Fairgrounds track. Typical of Sterling, he gives the credit for his success to someone else. In this case, it’s to son-in-law Michael House. To add to his impressive, time-defying performance, for the past five years Sterling has battled a Parkinsons-like ailment that at times causes his hands to tremble uncontrollably. If he wanted an excuse to hang it up and retire to a rocker and his scrapbooks and his barn-full of trophies, he’d have one. But he doesn’t want sympathy. “My heath is pretty good, as long as I take my meds,” he says. Sterling knows a thing or two about hard times, perseverance, and spitting in the eye of adversity. He’s a driver who ran 279 NASCAR Cup races over 17 frustrating years before finally winning one. He’s a driver who was severely burned in a fiery crash at Bristol but sneaked out of the Vanderbilt Burn Center in time to make the next race, wrapped in bandages like a mummy. He’s a driver who was initially falsely blamed – and later completely exonerated – for Dale Earnhardt’s fatal crash in the 2001 Daytona 500. Replays of the crash cleared Sterling from any fault, but not before he was the target of threats from bereaved Earnhardt fans around the country. He’s a driver who was on course for his first Cup championship in 2002 until his season was ended by a vertebra-crushing crash at Kansas. Yet he put the disappointment behind him and raced on, making the best of second-rate rides during the twilight years. “Ol’ Sterling, he’s something else,” says Gary Baker, who operated Fairgrounds Speedway during Marlin’s dominant years when he racked up three Late Model championships and many of his 62 division victories. Sterling, whose dad Coo Coo was one of NASCAR’s grittiest drivers and also one of the sport’s most colorful characters, began working on his father’s pit crew in his early teens. About that same time he started racing Late Models. He made his Cup debut in 1976, subbing for Coo Coo, who had suffered an eye injury. Seventeen years and 279 starts later Sterling finally won his first Cup race – and what a win it was: the Daytona 500, NASCAR’s crown jewel. Maury County turned out to celebrate. The next year Sterling pulled off a rare Daytona repeat. Those two Daytona wins were part of Sterling’s 10 victories in the Cup series over the years. Sterling announced his retirement in 2002 – from NASCAR, but not from racing. He returned to his roots at the Fairgrounds, and seems perfectly content away from the bright lights of the big leagues. Sterling’s grandson Stirlin, 13, used to be intrigued by racing but lately – like a lot of teenagers – has become more interested in video games. There’s still a chance his racing genes will prevail. Meanwhile another grandson, Colter, son of Sterling’s daughter Sutherlin and husband Michael House, is 4 ½ and rearing to go. Chances are either Sterlin or Colter will eventually carry on the family legacy as fourth-generation racers. They will assume the Marlin mantle and probably do it proud. Eventually, but not just yet. Grandpa’s still got some races to run.